"Our field work was sort of like reading an Agatha Christie novel. Who is the murderer?" Cox told CBS News. "We knew that other peoples on Guam, including the Filipinos, the Caroline islanders, U.S. military personnel, and expatriate Japanese did not get the disease, only the Chamorro villagers. So as ethnobotanists, we spent our time in the villages, rather than in the clinic, trying to figure out who the hidden killer is." They began to look into environmental factors that the Chamorro villagers were exposed to that none of the other people on the island confronted. Researchers discovered that cycad seeds, used to make flour for tortillas by the Chamorro people and eaten by flying foxes, another staple of the Chamorro diet, contained the neurotoxin BMAA. 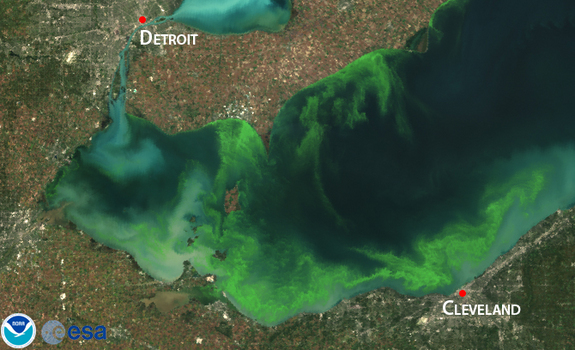 Researchers pursued the neurotoxin as the trigger and eventually found that it was also present in cyanobacteria in harmful algae blooms, also known as blue-green algae. Other studies have found BMAA can accumulate in fish and shellfish in South Florida and other areas where algae blooms are present, potentially entering the human food chain. "Cyanobacteria are all over the world," Cox said. "This opened the doorway to a global problem." But scientists were only aware of a correlation -- it was unclear whether BMAA actually caused the villagers' illnesses. To further investigate the link between BMAA and neurodegenerative diseases, Cox and colleagues fed vervet monkeys fruit dosed with BMAA. After 140 days, the monkeys developed neurofibrillary tangles and amyloid deposits in their brains, hallmarks of neurodegenerative diseases. Vervets given BMAA along with a supplement of the dietary amino acid L-serine had fewer tangles than the first group, but more than those that received a placebo. "When the neuropathology images started coming up, some of the neurologists started weeping. I couldn't speak," Cox said. "We knew that nobody has ever successfully produced [brain tangles and amyloid deposits] in an animal model." Scientists got the same results when they replicated the experiment: every BMAA-fed animal developed tangles and plaques. "This study takes a leap forward in showing causality -- that BMAA causes disease," Deborah Mash, Ph.D., director of the University of Miami Brain Endowment Bank and co-author of the study, said in a statement. "The tangles and amyloid deposits produced were nearly identical to those found in the brain tissue of the Pacific Islanders who died from the Alzheimer's-like disease." The study was published Tuesday in the journal Proceedings of the Royal Society B. Although the amino acid L-serine reduced the density of tangles in test monkeys, Cox said that it is too soon to know if it will work in people. Currently Cox along with partners at the Phoenix Neurological Associates in Arizona, and the Forbes/Norris ALS clinic in San Francisco, are concluding Phase I FDA-approved human clinical trials with ALS patients receiving daily doses of L-serine. Further research will help to determine if L-serine can slow the rate of disease progression in ALS patients and if it could be effective in helping early stage Alzheimer's patients. For now, Cox says that the research offers hope for people concerned about neurodegenerative diseases. "We have discovered that chronic exposure to an environmental toxin triggers Alzheimer's-type pathology in the brain," he told CBS News. "Thus people can reduce their risk of disease simply by avoiding exposure to cyanobacteria in harmful algal blooms or contaminated foodstuffs."